A cardiac arrest and a heart attack both affect the heart. Many people believe these serious conditions are the same but in fact, they’re not – they are totally different medical emergencies. In this blog post, we’ll explain the difference between a cardiac arrest and a heart attack. A cardiac arrest occurs when the heart suddenly stops beating and the person stops breathing. The victim will rapidly fall unconscious and requires urgent first aid and medical intervention. A cardiac arrest can occur for many reasons including medical conditions and traumatic injuries. A cardiac arrest patient requires immediate cardiopulmonary resuscitation and defibrillation. CPR involves chest compressions and rescue breaths to keep the person ‘alive’ by pushing blood around the body to keep the brain and vital organs alive. 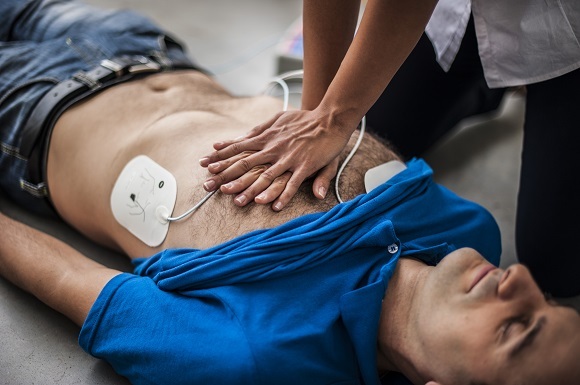 Defibrillation involves an electrical shock being delivered to the heart in order to restore the normal rhythm. Defibrillators are becoming more common in public places and workplaces, these devices are known as Automated External Defibrillators (AEDs) and they are designed to be used by lay rescuers with no medical training. A heart attack, on the other hand, is a medical condition where the blood supply to the heart muscle itself is compromised. This leads to the heart tissue being starved of oxygen and can lead to the heart cells dying. The pain from a heart attack is caused by the heart being starved of oxygen. The pain typically occurs in the center or left side of the chest and can radiate up into the neck or arms. A heart attack does not usually result in loss of consciousness. The patient is still breathing and has a pulse (the majority of the heart is able to function and pump blood around the body). However, a heart attack can lead to the victim’s heart stopping (a cardiac arrest) and in this case immediate CPR and defibrillation are required. With modern medicine, most people survive a heart attack and recover completely. The same unfortunately isn’t true for someone who suffers a cardiac arrest, though numbers of survivors are growing with increased public familiarity with CPR, quick response times by ambulances and health care professionals as well as public access AEDs. Yes this a common question on First aid training courses. would add to the information above, that some casualties experience heart attacks, but dont are not even aware they have had one. Thanks for giving the distinction of what is probably one of the most equivocated terminologies in relation to health and first aid! And CPR is definitely a skill people shouldn’t take for granted, and should immediately find ways to gain qualifications to perform the life-saving task as well! It’s amazing on how people state they had several cardiac arrests when they most likely had heart attacks. Because if an individual actually had so many cardiac arrests along with medication and treatment, it would raise questions on whether or not that person has serious condition to be looked after. Silly me! I didn’t even know there was a difference. Thank you for the very detailed information! I will keep this in mind.